Growing up in the Orlando area during the 90s, I had the pleasure of watching a young Stuart Scott cover sports on the local news for a few years. Then in 1993, Scott left the Sunshine State to join the ESPN family. For the next few years, he introduced a long list of popular catchphrases to the sports world that are commonly used by kids who weren’t even alive when he coined them. When most people see Stuart Scott on TV now — hosting SportsCenter or Monday Night Football or the NBA Finals — they think they are just looking at one of the hardest working guys in the sports world. That’s true. But they are also looking at one of the strongest and most inspirational humans too. 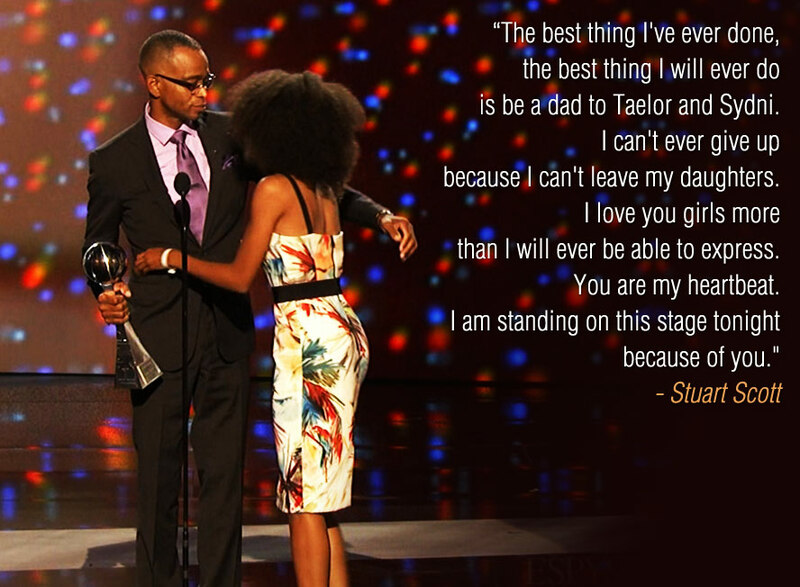 I’ve been watching Stuart Scott for 21 years now and never spent more than a few seconds thinking about it. After watching him on that stage, I spent the following 20 minutes thinking about everything I’ve done in the past 21 years – from my days in Florida to my current days with my two daughters.